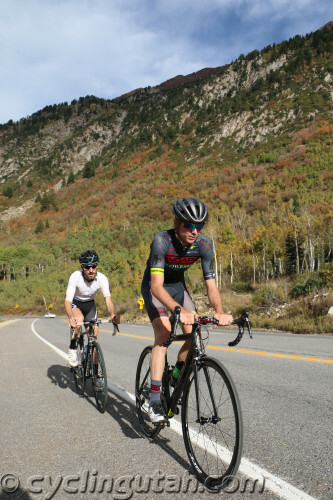 September 26, 2015 – Snowbird, Utah – Under clear blue skies and mild temperatures,160 racers lined up for the 37th Annual Snowbird Hill Climb and Ultra Hill Climb. 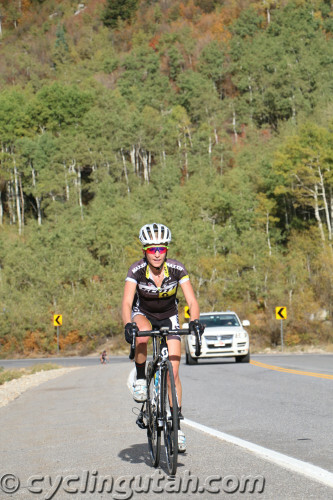 The traditional hill climb runs from 20th East and 9400 South in Sandy to Entry 2 at Snowbird. The Ultra Hill Climb continues the pain to the top of Hidden Peak (elevation 11000’). Rob Squire (Hincapie Racing) and Mikaela Kofman (Scott 3Rox Racing) dominated the men’s and women’s categories. The lead riders stayed together on the 3500’ climb until Tanner’s Flat, when Squire attacked. Only Chris Mackay was able to stay with him. World Cup mountain bike racer Kofman, Mitchell Peterson, Mark Zimbelman, and Spencer Johnson weren’t able to latch on as Squire set a blistering pace. Mackay seesawed just behind Squire and finally lost contact around Entry 1. Meanwhile, Johnson and Zimbelman stayed close, with Peterson Kofman just behind. Squire crossed the line first in 47:45 with Mackay 45 seconds back. Johnson, Zimbelman, and Peterson rounded out the top 5. Kofman won the women’s division with a time of 50:23 and finished 6th overall. Breanne Nalder, 2014 race winner, was second at 51:39, and Marci Kimball was 3rd in 56:03. Squire wasn’t done for the day, however. He, Kofman, and 25 more riders went on to the top of the Tram in the Ultra Hill Climb. Following the finish at Entry 2, riders snaked through the parking lot to Gad Valley where they dropped of their road bikes and jumped on their mountain bikes for the 3000’ foot climb on the windy dirt roads through Peruvian Gulch. Squire topped all with Mitchell Peterson in 2nd, and Richard Delcanto in 3rd. In the women’s race, Kofman won (and finished 3rd overall), followed by Breanne Nalder (on a borrowed mountain bike) in 2nd and Kandice Lund in 3rd. 24 JOHANSEN Kevin 53:51:00 s.t. 76 RIEL Louis CANYON BICYCLES- SHIMANO 1:02:59 s.t. 95 ATKINSON Blake A Bloc 1:05:16 s.t. 128 SPENCER Abbie 1:12:39 s.t.